"A refreshing white wine sangria that is always a hit at parties." In a large pitcher, combine dry white wine, peach vodka, lemonade concentrate and sugar. Stir until sugar is dissolved. Add sliced peaches, red and green grapes. Refrigerate sangria until well chilled, at least 2 hours, or overnight to blend flavors. 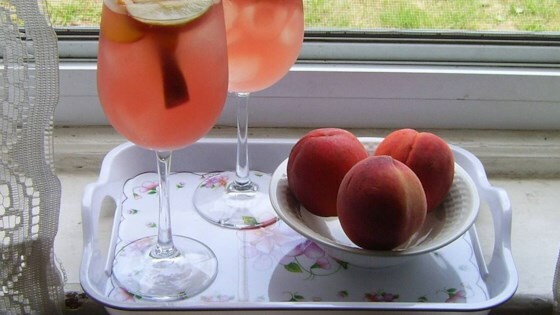 Serve over ice, and use a slotted spoon to include sliced peaches and grapes with each serving. Watch how to make this authentic version of the popular wine drink. I use a fume blanc or sauvignon blanc. You may also use frozen peach slices. Fantasitc drink for a summer party. I used a Pino Grigio ,sliced apples, peaches and grapes. Also, could not find peach vodka a great substitution was 1/2 cup peach schnapps and 1/4 cup brandy.